… and Dennis. Well, sort of. He’s an honorary Hipster Kitty. We think you will enjoy today’s interview. 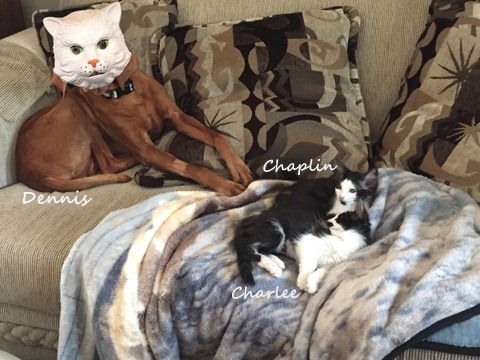 Many of you have already met Dennis the Vizsla and are aware the Hipster Kitties Charlee and Chaplin moved in a while back and joined Dennis’ band of assorted merrymakers. If you aren’t aware, you are in for a treat because you are about to meet them. Chaplin: Charlee, you have to stop talking so that I can introduce myself. Charlee: I’ll do it. This is my brother Chaplin. He’s annoying sometimes, but I love him. Anyway, as I was saying, our humans are Mama and Dada. Chaplin: We keep them around because they know how to open the cat food cans. Charlee: Plus we use Dada as a typist. Chaplin: Yes, it’s difficult to do your own typing when you don’t have fingers. Chaplin: This is our brother, Dennis the vizsla dog. Dennis, say hello to the Funny Farmer Felines and their nice Mousebreath readers. Dennis: Am too a cat. Chaplin: Your floppy ears and stubby little vizsla tail say otherwise. Dennis: But I want to participate in the interview. 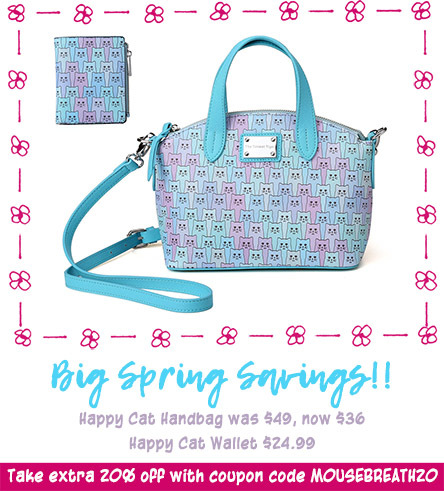 I heard you’re getting paid in treats afterwards. Charlee: We’re not getting paid in treats. You might as well go back to sleep on the sofa. Chaplin: Good job getting rid of Dennis by telling him we’re not getting paid in treats for this interview. Charlee: It’s just the truth. We’re not getting paid in treats. Chaplin: We’ll see about that. Charlee: I suppose we will. By the way, Dennis insisted we include that picture of him wearing a cat mask, but feel free not to embarrass him by using it. 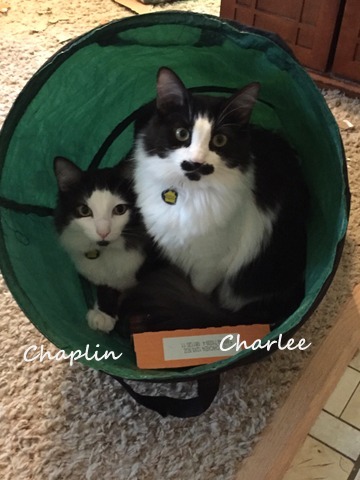 Charlee: Well, Chaplin and I were part of a litter of feral kittens. We were picked up along with our mother and taken in to the Humane Society. Chaplin: Mama was volunteering for the Humane Society at the time and saw us listed on the volunteer web site as new arrivals. Charlee: She thought we were cute and that she might be ready to have cats again. Chaplin: Rumor has it she had recently been binge watching something called ‘Thug Life Cat’ on YouTube, so that might have had something to do with it. Charlee: Anyway, Mama and Dada came to meet us in the shelter and took us under a foster-to-adopt agreement. We got along well with Dennis, and so we ended up getting adopted. Chaplin: Dennis was already here of course. So we inherited him. Charlee: Sort of like hand-me-down luggage. Charlee: We live in Oceanside, California, just north of San Diego. Chaplin: Apparently this area is noted for good weather. They call it a Mediterranean climate, although I don’t think we’re anywhere near the Mediterranean. Charlee: The weather is usually warm and sunny, which I guess qualifies as “nice”. Chaplin: We could do without the wildfires though. Chaplin: I don’t think anyone has ever called me “Nick”. Charlee: Dada doesn’t call me Skunk! Chaplin: I’m pretty sure he does. I have nicknames too, like Chappie, Chap-Chap, and Kit-Kat. But not Skunk, like Charlee. Charlee: NOBODY CALLS ME SKUNK!!! Chaplin: And of course we’re both called Hipsters, on account of my soul patch and Charlee’s little moustache and goatee. 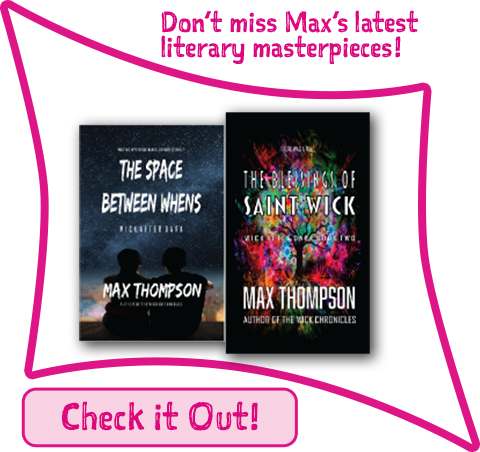 Charlee: And also because we write bad poetry. 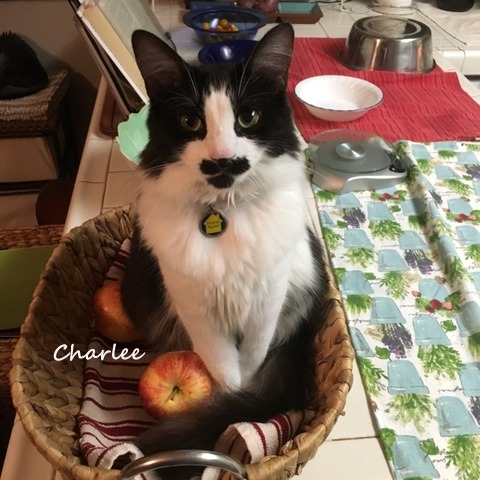 Charlee: I am a sweet girl who never gets into mischief. Except for the time I crawled into the armoire and tore open a bag of Dennis’s dog food. Charlee: Oh, and the time I kept unrolling the paper towels and shredding them. Chaplin: I go into Mama’s closet and chew on her clothes whenever I can. Also I steal. Charlee: And the time I unrolled all the toilet paper. But that’s basically the same thing as what I did with the paper towels so it doesn’t count. Chaplin: Did I mention that I steal? Charlee: He really does. Check your pockets after the interview. Charlee: Dennis already had one when we got here, so of course we showed up on it. Chaplin: He likes to tell me, “Someday, Chaplin, this will all be yours.” So I can only imagine he makes a fortune at it. Charlee: I think he meant to say it would be ours. Yours and mine. Chaplin: No, he said it would be mine, because I’m his favorite. Charlee: Why would you be his favorite? Chaplin: Well, for one thing, I gave him a massage once when I was making muffins on the blanket he was sleeping under. Also, I don’t compare him to hand-me-down luggage. Chaplin: I guess Dennis has in the past, but that was before a stray parakeet gave him a nervous breakdown and he became a shut-in. Chaplin: Dennis tells me things. I told you I was his favorite. Charlee: I don’t think so. Chaplin: What are the Cat Scouts? Are they like talent scouts? Charlee: Ooh, if they are like talent scouts, maybe they could help us get a new poetry reading gig. Chaplin: My greatest love, after Charlee of course, is cuddling with Mama and making muffins on her fuzzy blanket. Charlee: Mine, aside from Chaplin, is sitting on Dada’s lap in the office and trying to eat his headphone wires. Chaplin: My greatest fear is that somebody will forget to feed me. Or that something will happen to Mama’s fuzzy blanket. Charlee: Mine is being mistaken for a skunk. Charlee: Mama and Dada have fostered various animals, like Dennis, and Dennis’s doggy sister Trixie who we never met but who Dennis never shuts up about how wonderful she was. Chaplin: And they also fostered us, the Hipster Kitties. Charlee: Yes, of course, us too. Chaplin: They usually end up adopting whatever animals they foster. Charlee: Mama has moved from volunteering at the San Diego Humane Society to working there part-time, helping to teach the dogs how to behave. Charlee: She hasn’t brought home any new dogs, though. Chaplin: I am an extrovert. And a chow hound. Charlee: You’re also bossy and overly rambunctious sometimes. Me, I’m a sweet little lady, and an introvert. Except in the office, where I’m very pushy about being in Dada’s lap. Chaplin: I think that makes you a Snoopervisor. Charlee: I’m also a much better jumper than Chaplin. Chaplin: I thought we agreed you were going to stop bragging about that. Charlee: Stating facts isn’t bragging. Funny Farmer Felines: What do your humans love most about you? Chaplin: Mama says I’m her boy. She loves that I sit in her lap on the sofa making muffins on her blanket. Also she says I am very smart. Charlee: She says I’m smart too! But I’m a Dada’s girl. He likes when I sit in his lap and snoopervise. Sometimes I reach up and make muffins on his face. He likes that too. Funny Farmer Felines: Is there anything we missed that would pertain to you? Chaplin: We’re Tuxedo cats, which means we’re better-dressed than anyone in the house, including Dennis. Charlee: I like to play fetch. Dada says I’m the only cat he’s ever had who does that. Chaplin: I think that’s about it. Now we get our payment of treats, right? Charlee: I told you, Chaplin, we don’t get paid in treats for this. Chaplin: I’m calling my agent. Funny Farmer Felines: Now aren’t you glad you stayed for the interview? 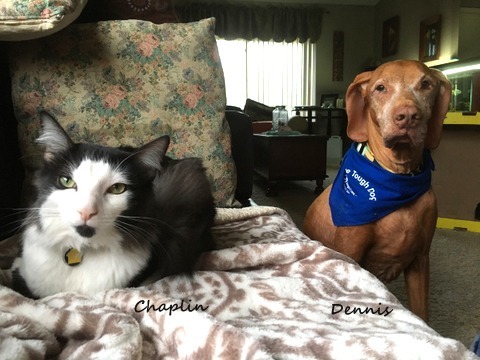 Charlee and Chaplin can be found, when not bantering or bickering, cuddling with Dennis at Dennis the Vizsla. We apologize for being absent for a few months, but sometimes life happens and there isn’t anything you can do about it except ride the current over the waterfall. Oh my, you two kitties are hilarious! And Dennis…well, too cute! I’m off to visit your blog page! That red kitty with the white face is pretty cute too!! Sorry, guys – all of you. Marcus ate all the treats before the interview, so we couldn’t pay you, but now you’re experienced interviewees and you can name your treat price for the next one. Nice to meet these sweet kitties. I love these photos of them cuddling. You 2 should join Cat Scouts, it is lots of fun. Oh my you guys are totally epic!!!!! I need to visit your blog! Sweet kitty conversion is very fun to read and enjoyable. I had fun reading this blog. 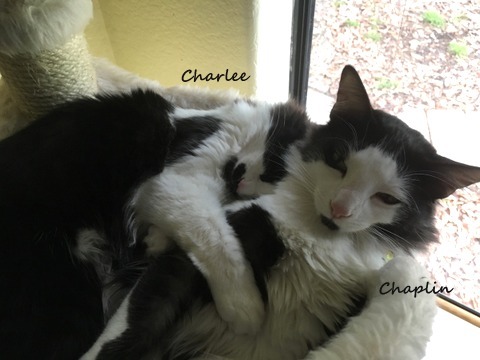 Charlee and Chaplin both are very cute.